And now, as Obama will finally step into the White House, the analysis will somewhat shifted from how deep the impact will be into how fast the comeback will occur, accelerate, and affect the rest of the world. Talking from macro economy, Obama’s figure and his nature as a Democrat will bring more future positive signals to the market in currently tottering US economy. As Obama often said in his campaigns, he denounced wars thus excessive expense for US military may be adjusted and reallocated to a more welfare-centric budgetary. Simply speaking, US might not be too involved in gulf countries and other regions in conflict but instead realign its interest in recovering internal economy, including IT sectors that back up the country’s prosperity. Obama and Biden strongly support the principle of network neutrality to preserve the benefits of open competition on the Internet. 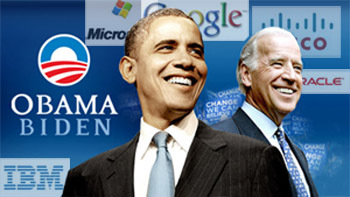 Obama and Biden believe we can get true broadband to every community in America. Obama and Biden will ensure our goods and services are treated fairly in foreign markets, invest in the sciences, and will provide new research grants to the most outstanding early-career researchers in the country. Analysts expressed that one of Obama’s winning strategies was massive utilization of the internet to spread his campaign, brand his image, and influence voters. This strategy was later proven successful to the widespread of “yes we can” hype and hope not only to US voters but also to other netizens. If it’s not too naive to draw a conclusion, we can see that Obama is aware of technology, its advancement, and how it can bring impact to real life, taking part in the evolution of human culture and behavior. With such awareness, it won’t be surprising if later on during his tenure, he brings more modernization to the governmental offices and services in order to create a more efficient governance. His assurance to the openness of the internet undoubtedly will keep the interests of private sectors to the internet. His promise to bring broadband internet to broader US-based users will foster the growth of more interactive internet based on multimedia. As currently real-time content media is still a challenge, not only in academic field but also from business feasibility perspective, leveraging this policy will surely increase more optimism on the beginning of new wave of real-time rich-content media internet that will partake or even reinstate currently evolving social-driven internet. We may see some start-ups based on this model later, adopting current community-centric service -the social internet- with more versatile and massive content media. We will also see how internet becomes more pervasive in mobile devices that are currently still suffering from bandwidth limitation. Current researches in 4G may address some shortcomings of mobile technology in terms of bandwidth availability, network addressing, and more reliable connection. In the past and also these recent years, countries outside the US have been enjoying the enormous demand for services and goods from US market. US economy relies on foreign countries to fulfill its domestic demand at averagely lower prices compared to those of provided by local industries and providers. The demand is an incentive for the exporting countries, a significant factor for their economic growth. In turn, US trade balance has always been deficit these recent years, with only difference in the amount of the deficit. When US economic growth started becoming sluggish due to the credit-crunch and its after effects, exporting countries also started suffering from deceleration in their national growth. Those exporting countries have big dependency on the well-being of US macro economy. Stagnancy in US economy is reflected in stalled growth of demand in its domestic market. While exporters keep producing and offering services, they will fail to sell the goods and services at the projected calculation because market is now harder to penetrate. This, in consequence, brings harms to exporters as they now have to deal with potential losses resulting from the dwindling revenue and abundance of unsold stock. Subsequently, they have to adjust the size of future production to accommodate the change. When the production cut is common to exporters from certain country, the impact is more significant to the deceleration of the country’s national growth. As Obama hinted the plan towards improvement in volumes and values of US export, it can be perceived as both challenge and opportunity to exporting countries of US. First, since exporting is usually more lucrative than fulfilling demand of domestic market, US has to work on the tariffs and pricing of the traded goods and services. For sophisticated goods that can not be produced in target market, apparently this is not a big problem since it already has its own niche. However, if the target market has the substitutes for the goods, US products still have to battle with local products which are usually cheaper. In order to make the product more competitive, US industries have an option to harness current outsourcing models by establishing partnership with overseas companies and instantiating remotely-controlled product chains. The final products should be cheaper while still preserving their desired qualities. This method has been running in the ecosystem for a while, merely due to the comparably expensive cost of US labor which contributes significant part of the selling prices of the final products or services. Secondly, attempts to improve competitiveness of human resources in US may result in more techies with competencies ranging from practical knowledge to in-depth understanding like researchers. Adhering to demand-supply law, this may lower the average cost for IT-related work because more IT guys will be available. Meaning, using cost-benefit analysis, companies may reconsider off-sourcing their work to overseas if local guys and SMEs also offer comparable services. This might jeopardize some of overseas companies although it’s understandable that those who really stand out will still get their calls. The question now lies on how fast US makes the shift into a country with more progressive export thus reducing its balance deficit? I’m still convinced that US balance stay negative for the next two years. In a more generalized term, US unanimously performs the characteristic of most supreme economic power. However, when the gap starts narrowing, there will be interesting phenomenon on how countries worldwide market their products and services to US market and how local industries and companies in US find their consumers.